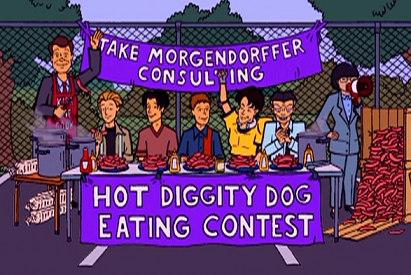 "Prize Fighters" was the eleventh episode of season five of Daria (episode number 511). It first aired on MTV on June 11, 2001. College approaches, so Helen insists that Daria starts searching for scholarships. After some grumbling from Daria, she searches the internet and discovers a ten thousand dollar scholarship, awarded by the the Wizard Foundation, set up by Wizard Computers, to the student "who best embodies the Wizard pursuit of excellence" (sic). It requires an essay, answering the question 'How would you change the world if you could?' along with filling out forms. At school, she mentions the prize to Jodie, who tells her that these requirements are fairly standard for scholarships. Daria eventually writes and sends an honest and observant essay advocating the elimination of money. She defends her essay by saying that she'd rather be herself than become fake just to win a prize. Jane's responses tend to be cynical, though a bit harder-edged than usual. Meanwhile, Jake has a problem of his own: due to a mistake filling on-line buy forms, he has received an enormous quantity of frozen hot dogs, instead of the prime rib he wanted. He tries to return them, to no avail, and starts adding them to recipes that only make the Morgendorffers, along with Jane and Tom, sick of hot dogs. A few days pass, and Daria receives a letter informing her she has made the finals for the prize and will be interviewed. She is surprised to learn that Jodie and Upchuck have also applied and are also finalists. Daria feels that she has no chance to win, as she feels Jodie, more conformist and positive, and Upchuck, who has started a dotcom business just like the one Wizard's CEO Mark Straum did (and importing the very candy's Straum loves! ), are sure to make a better impression during the interview than her. Both Helen and Jodie recommend an interview coach to help prepared Daria, an idea Jane scorns. As Tom is helping preparing Daria for the interview, he informs her the Wizard Foundation has a very conservative attitude regarding the employment of women and minorities in top positions. Daria informs Jodie of this, hoping both would give up the process, but Andrew Landon - who already knows of Straum's views and has a hearty laugh at them - convinces both to go, saying if both of them refuse to take the opportunity, then they will never be able to change Wizard's attitude regarding employment. Daria ends up deciding to go, and has a (predictably fruitless) session with Dr. Danada, an interview coach. Daria, Jodie and Upchuck are interviewed together by Mr. Brower, a Wizard employee. Jodie provides stock, conservative answers, Upchuck tries to woo the interviewer with compliments and the use of treats he knows the CEO likes, while Daria gives cynical answers. Unimpressed by Jodie and Upchuck, Mr. Brower asks Daria whether she really wants the prize. When Daria gives a lengthy negative answer addressing the Wizard Foundation employment policy, Brower expresses dismay at her decision and informs her she had received good marks for her "Light-hearted spoof" essay, a description that takes Daria by surprise (since her essay was meant to be honest and anything but light-hearted). Five bucks on Mr D.
In the end, none of the three Lawndale students win the prize. Jodie and Upchuck lament over how they used the wrong strategies in the interview. Daria also laments not getting the prize, realizing that she did want it after all, though not enough to win it. Both Daria and Jodie lament their lack of ethics in the whole application process. 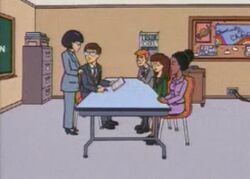 Later, as Jane and Daria discuss the situation, Jane confesses the reason for her angry reaction before: she was jealous that three intelligent students were competing for a prize she wouldn't be able to apply for, due to her lack of academic achievements. Both try to figure out why they even cared about things like this, finally realizing they're growing up. Meanwhile, Jake finds a way to get rid of the huge order of hot-dogs: he organizes a hotdog eating contest at Lawndale High! Upchuck starting up "a dotcom" places this before the dot-com bubble burst, and written it would've been meant as a joke on how easy it was to set up a profitable dotcom ("you've started a dotcom?" remarks Daria). Unfortunately, once the episode aired the bubble had burst months ago. The first stories about it being a bubble came out in spring 2000, and Daria would've mentioned this to burst Upchuck's bubble (ho ho) if she'd been aware of such stories. This episode is unlikely to be taking place too early in the year (if you assume this occurs in 2000). The Wizard Foundation, as a stereotypical "evil corporation" fronted by a racist, sexist "redneck billionaire", brings to mind H. Ross Perot's software and services firm, Electronic Data Systems, notorious for its authoritarian corporate culture when Perot ran it. Danada is an allusion to the Spanish expression de nada ("it was nothing"). So, his name and title could be translated as "Doctor of nothing." Alternate universe versions of "Prize Fighters" include Not So Different 64: Where You Might Not Expect it by J-D, featuring a gay male alternate of Daria. The presence of Upchuck alongside Daria and Jodie as finalists, as well as the creation of a functioning dotcom, is an indication of his resourcefulness and intelligence, which have often appeared in fanfiction. In the Legion of Lawndale Heroes universe, Wizard Computers was co-founded by Russell Stark; it was the endowment of his multi-billion dollar fortune, and the full resources of the Quest Foundation, that allowed for the creation and operation of the National Legion and the operations of Lawndale's Legion Tower. This page was last edited on 8 April 2018, at 08:03.